Trying to figure out how to convert slow cooker recipes to pressure cooker? Or Instant Pot? In today's #AskWardee, I'm going to tell you how to do it. 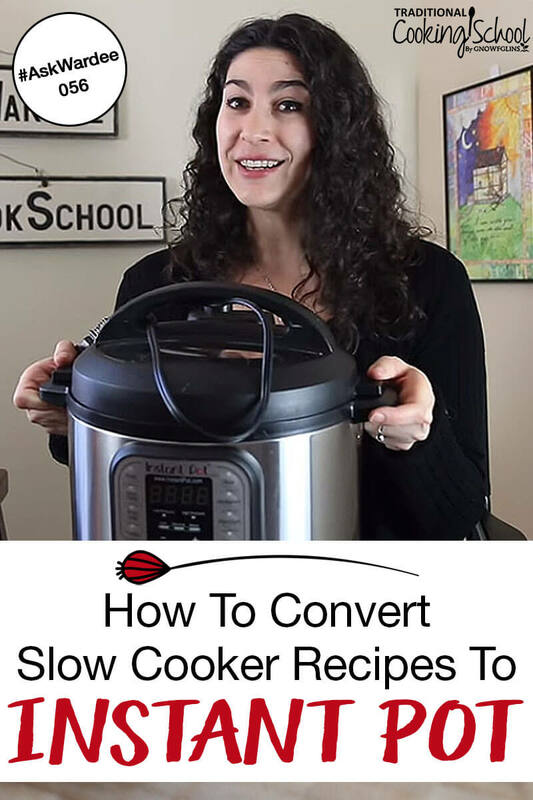 Just follow a few simple principles to convert your slow cooker recipes to pressure cooker (or Instant Pot) and you'll be off to the races! Here are the loose leaf tea bags I'm showing off today. I LOVE these! They help you avoid the mess and inefficiency of a tea ball or tea strainer. Just slip your loose leaf herb mix inside and put in your tea cup. No mess at all because it's tall enough to hold the loose herbs and still reach the top of your cup. And… today I'm drinking Herban C Tea Mix from Bulk Herb Store. It's so yummy and good for you. It's my new favorite tea! Let me tell you how… Keep these 9 tips in mind for easy conversion of your favorite crockpot recipes. 1. Is The Recipe A Good Candidate For Converting? Some crockpot recipes aren't good candidates for pressure cooking. Here are a few guidelines to help you figure out if your recipe will convert well (also you can use these guidelines when creating pressure cooker recipes). Has Enough Liquid — Pressure cookers require liquid to function properly. How much varies from unit to unit, though 1 to 2 cups is standard. So if your recipe already has liquid, great. If it doesn't, make sure to add the minimum. Does Not Have a Fried, Crispy Coating — The pressure cooker is all about steam, not a crispy finish. However, I've found that crumb toppings (such as on this crisp and this sweet potato casserole) do pretty well. Isn't A Super Tender Cut Of Meat — The pressure cooker is amazing for every day cuts of meat — you know, the tougher ones. If you've got a succulent, expensive, tender cut of meat (like a T-Bone steak), don't ruin it by pressure cooking it! Wine doesn't evaporate under pressure, so it stays tart and raw. Again, you can add wine at the end and simmer (with the lid off and not under pressure). Finally, thickeners, such as cornstarch or arrowroot, should not be cooked under pressure. Instead, mix them with water and whisk them in at the end with or without some heat. Often I add arrowroot at the end and the dish is still so hot there's no need to have it on Sauté. 3. Pressure Cook The Meat/Broth/Grains/Beans First, Then Add Veggies. Your slow cooker recipe for stew may have had you combining all ingredients (meats, grains, beans, and veggies) and setting it to low for 8 hours. That's OK for most ingredients when converting to the pressure cooker, but I guarantee your veggies will be mush if you add them at the beginning. Better to make that recipe in stages. Say half hour to cook the meat/rice/beans, then release pressure, then add your veggies and cook under pressure for a few to 10 more minutes. Check your manual, this online chart, or Lorna Sass' book Pressure Perfect for timing on different food items. Go with the timing on the food that needs the longest time. If it’s a meat-based dish that can be cooked 8 hours on low or 4 hours on high in a slow cooker, it’s almost guaranteed that it will be done to perfection in 25-30 minutes in a pressure cooker (source). Cut the meat into smaller pieces (they take less time to cook) so they'll come closer to the timing on the other ingredients. This is assuming the meat requires the longest cooking time, which it usually does. Cook the recipe in stages. See #3 above. When pressure cooking, very little liquid is lost to evaporation. So in general, you should probably reduce the liquid in the original recipe to 1 to 2 cups when putting it in a pressure cooker. Grains and Beans — Use the exact amount needed to fluff them up, with a bit more for the other ingredients in the recipe. Soup — Use the amount of liquid you actually want in the finished result. If you're pressure cooking a baked dish — such as a crisp, quiche, or bread — you'll put that batter/mixture in a baking dish and put that inside your cooker on a rack. Make sure to pour the minimum amount of water (1 or 2 cups) inside the cooking unit (so it surrounds your baking dish but is not inside the dish itself). A good cover for a baking dish is a plate or lid from a pot or a piece of parchment paper followed by foil. 6. Quick Or Natural Release? Meats generally do best with a natural release. I make exception when I'm doing a recipe in stages — like I need to add vegetables and cook more. In which case, I do a quick release, add the veggies, and add a few minutes under pressure, then quick release again. Vegetables do best with quick release — otherwise they get mushy. In my experience, rice and beans do well with either type of release. You know those slow cooker recipes that have you brown the meat on the stovetop first? Using a pressure cooker or Instant Pot is even better because you can do that in the same pot — no mess! And it makes a big difference in flavor. So, put the Instant Pot on sauté. (Or put your stovetop cooker on medium to medium-high heat.) When it's hot, add some cooking fat. Put your meat in and brown on all sides. If you have many pieces, like 8 chicken thighs, do them in stages so they're not overcrowded. Then proceed with the rest of the recipe, not on sauté anymore but rather under pressure. It's still important to operate your Instant Pot or pressure cooker safely. Make sure the seal is clean and well seated. Ensure the venting knob is in the sealing position. Check that the valves are clean and the condensation cup is clean and empty. Have you converted any slow cooker recipes to pressure cooker? What tips would you add? Thanks for the tip on tea bags. I’ve been using coffee filters. I put the herbs in and twist the filter around tightly then I use one of those (useless) tea ball strainers to clamp the filter so it won’t un-twist. Love those new tea bags you have. Thank you so much for all this detailed information. I am so excited that it is doable! Wine doesn’t evaporate under pressure, so it stays tart and raw. Again, you can add wine at the end. such as cornstarch should not be cooked under pressure. or, mix them with water and whisk them in at the end with. Often add arrowroot at the end and the dish is super. Enjoy ……..